AMHERST — It was only a few minutes after the Boston University men’s hockey team tied the University of Massachusetts, 3-3, but Matt O’Connor had already moved on from the blown third-period lead and his 46 saves. He had mentally left the Mullins Center Friday night and was focusing squarely on Monday’s first round of the Beanpot Tournament. O’Connor, who will start for the Terriers against No. 2 Boston College at TD Garden, mentioned Beantown’s annual four-team tourney four times in a four-minute span. “I thought there was a lot to build on and I’m ready to win the Beanpot,” O’Connor added. “Definitely a lot to build on there and carry into Monday night. It’s only a one-game sample, but it’s safe to say O’Connor was in the zone against the Minutemen. He took advantage of his first game action in nearly three weeks by making a number of flashy glove saves and, until the final minute of regulation, helped BU’s lead stick despite UMass’ gaudy 49-22 shot advantage. It was an important bounce-back game for O’Connor, who had been pulled in each of his last two games, rough outings against Harvard University on Jan. 4 and the University of Maine a week later. It was a perfect example of what O’Connor has worked on with goaltending coach Mike Geragosian in recent weeks. O’Connor explained that during those “two bad periods,” about five of the eight goals came through traffic. He took responsibility for not doing a good enough job to either find different lanes to see or moving the opposing player screening hm. So he worked at his lateral movement — not hard with his long legs — and being more aggressive when it comes to intruders in his crease. Early in the game Friday, it resulted in a roughing penalty. But overall O’Connor was happy with the improvements. “I’m moving a little bit more agile, trying to find [the puck] and choosing a different lane and getting my hands out in front,” O’Connor said. “On a couple of plays tonight even, I caught pucks through traffic and I think that definitely helps. O’Connor’s sharp performance, parlayed with Maguire being under the weather, made picking a starter for Monday’s game an easy one. BU played BC close when the teams matched up at Conte Forum two weeks ago. Quinn made sure to note it was a one-goal game late, with the Terriers threatening to tie it when they pulled their goalie. It’s not outlandish to expect a similar game on an even bigger stage Monday. ANN ARBOR, Mich. — During the early goings of the third period, the No. 13/14 Boston University men’s hockey team found itself in jeopardy of seeing its 1-0 lead disappear. After a scrum in front of the net, the puck bounced to the right of sophomore netminder Matt O’Connor, skidding over the goal line and eventually going under the net as it lifted off the ice. the University of Michigan on Oct. 25. As soon as the referee signaled goal, O’Connor, who already had more than 30 saves at the time, rushed toward an official. From the Toronto native’s perspective, Wolverine winger Luke Moffatt had pushed the puck across the crease using his glove. “I just remember seeing no stick in the guy’s hand, and he was sort of in the crease,” O’Connor said. “Then he just kind of sweeped it in with his hand. I just immediately wanted to get to the ref before he made a full-out decision, and let him know. Just moments later, the officials determined via video review that the goal did not count. What looked like a break for the Terriers, however, did not last for long as Michigan capitalized on penalties to ultimately defeat BU 2-1 at Yost Ice Arena. While the Terriers struggled to keep the puck in Michigan’s zone and, eventually, faltered against the top power-play unit in the nation, O’Connor’s performance kept BU in the game. According to BU coach David Quinn, who has bounced back and forth between starting O’Connor and sophomore Sean Maguire, the decision to start the 6-foot-6 netminder was based off a hunch. O’Connor started off the game by stopping all 14 shots that he faced in the first frame. Nine of those 14 shots came during the Terriers’ three penalties. For O’Connor, getting a lot of action early, as well as hearing the taunts of “sieve” from the crowd helped him to focus in the beginning of the game. O’Connor continued to stymie the Wolverines’ offense through the second period as he picked up 16 saves. After the goal was called off in the third frame, however, O’Connor and the Terrier defense could no longer fend off Michigan. In between the Wolverines’ two goals, O’Connor grew heated and pushed Moffat. O’Connor, however, was not penalized for the shove that landed Moffat on the ice. Although O’Connor recorded more saves during the game than he had in any other start this season with 42, he will not make the start against Michigan State University on Saturday, according to Quinn. ANN ARBOR, Mich. — For 45 minutes Friday night, Matt O’Connor appeared on his way to stealing the No. 13/14 Boston University men’s hockey team a win over No. 4 University of Michigan. Then penalties did the Terriers in. The Wolverines (4-0-1) scored twice on the sophomore goaltender in a span of a minute and a half in the third period for the 2-1 win at Yost Ice Arena. BU (3-2, 1-0 Hockey East) was outshot 44-19 while suffering a loss to open its 2013-14 road slate. Quinn harped quite a bit about penalties, and with reason. The Terriers allowed Michigan 14 shots on five power plays — including three in the first 10 minutes — and given that the Wolverines entered the night with the top conversion rate in the country (37.5 percent), it was only a matter of time until they broke through. That finally happened with senior captain Garrett Noonan sitting in the penalty box after a tripping penalty. With 30 seconds to go on the power play, Michigan freshman Tyler Motte one-timed a shot from the back door to ruin the shutout bid and knot the game, 1-1, at the 7:16 mark in the third. Moments later, with Michigan possessing most of the momentum, sophomore wing Mike Moran hooked junior Alex Guptill as he drove to the net for a one-on-goalie opportunity, resulting in a penalty shot. Guptill converted on the ensuing chance by beating O’Connor five-hole to give the Wolverines a 2-1 edge. BU (3-2, 1-0 Hockey East) had myriad chances in the final minutes — including one with Wolverine netminder Zach Nagelvoort caught way out of net — but couldn’t finish. The third-period lapses put a damper on what had been a very sharp game for O’Connor, who finished with 42 saves. He carried the Terriers to a 1-0 lead through the first two frames, aided by a pretty goal from freshman wing Robbie Baillargeon. The first period was a lopsided one — BU was outshot, 14-6 — but it capitalized on one of its few chances to take a 1-0 lead into the locker room. The Terriers were threatening in Michigan’s zone when Noonan won a forechecking battle behind the net and ended up in the bottom of the right circle. He sent a short pass to Baillargeon, who managed an off-balance shot from the dot before falling backward. The tally, Baillargeon’s fifth point in five games, made it through clean over Nagelvoort’s glove-side shoulder. O’Connor and the BU defense started to teeter at the start of the third. The Wolverines appeared to knot the score at one after a scrum in front of the BU net about three minutes in, but the officials waved it off after a review. The puck crossed the goal line before the net came undone, but replays indicated senior Luke Moffatt’s hand was what got it that far. O’Connor came up strong again about a minute later with a big pad save before the Terrier defense cleared the rebound. 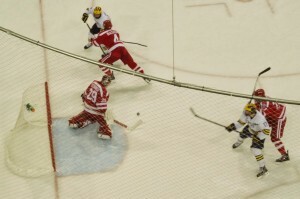 Then, with the Noonan and Moran penalties, Michigan finally found the back of the net. Quinn pulled O’Connor for the final minute and a half but to no avail. Sophomore defenseman Ahti Oksanen missed the last few minutes with cramps, but should be good to go Saturday when BU visits Michigan State University. 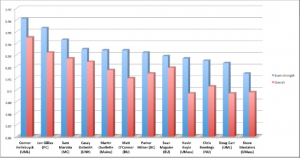 Separating a goalie’s performance from his team’s performance is difficult. After all, he can’t stop a shot, or let one past, unless it gets through five other players first. The topic comes up often on our live blogs, and in discussions about hockey in general: how much to credit a goalie in a win or blame him for a loss. With those questions in mind, I took a look at a few less conventional goaltending stats for all the Hockey East goalies who have played at least 40 percent of their team’s minutes. * I looked at even-strength save percentage, quality starts (which are based on the same principle as quality starts for pitchers), and average shots against per game. The idea behind evaluating goaltenders by even-strength save percentage isn’t that goalies shouldn’t be held responsible for power-play goals against, but rather that being a man down makes the other team more likely to score than they are at even strength. Especially on oft-penalized teams, goals outside of even strength can have a significant effect on save percentage, so even-strength save percentage is seen as a more reliable indicator of the way a goalie has played. A few observations: First, if I learned nothing else from this project, I found even more proof that Jon Gillies has been Hockey East’s best goalie this year. At even strength, he allows goals on less than five percent of the shots he sees. UML’s Connor Hellebuyck technically leads him now, and a .961 mark is surely impressive, but Hellebuyck has made 16 starts to Gillies’ 31. 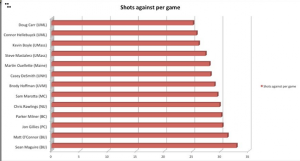 As we’ll see, Gillies also faces significantly more shots per game. Interestingly, BU’s Sean Maguire has the smallest gap between his overall save percentage and his even-strength one, which could reflect that he’s played better than average in special teams situations. Quality starts have the same idea for goalies as for pitchers, but the method of calculating them is slightly more complicated. In the original Hockey Prospectus article, the parameters for a QS were laid out as follows: the goalie either records a .912 save percentage in the game, or he records a save percentage of .885 or better while allowing fewer than three goals. I adjusted that slightly, changing the then-NHL league average save percentage of .912 to the Hockey East average, .910. Due to the small sample size, this is by no means perfect, but at the NHL level, a good goalie gives his team a quality start about 55 percent of the time, and the most reliable do it about 60 percent of the time. Again, Gillies and Hellebuyck come out on top with the greatest percentage of quality starts. QS’s serve as a decent substitute for wins in evaluating goalies, and the gap between a goalie’s quality starts and his wins can start to separate his play from that of his team. For instance, Gillies has 22 quality starts and only 15 wins, and Maine’s Martin Ouellette has just nine wins in his 16 quality starts. On the flip side, Boston College has found a way to win even when Parker Milner doesn’t keep them in it – he’s made 17 quality starts but gotten 20 wins. Maguire and Matt O’Connor have made 11 and 10 quality starts, respectively, and gotten 10 and eight wins. Finally, I looked at the number of shots each goalie sees on average per game, to add some context. Despite having the second-best shot-blocker in the nation, senior defenseman Sean Escobedo (and, until recently, then-top shot blocker Alexx Privitera), BU has let the most shots through to its goalies of any Hockey East team. Both Maguire and O’Connor have faced more shots on average than any of the other goalies, and Maguire has faced the most – 32.8 per game. It’s no surprise that Lowell’s two goalies, Doug Carr and Hellebuyck, saw the fewest shots per game behind the River Hawks’ stifling team defense. And, in accordance with the fact that they allow the most shots, BU has also given up the second-most goals in the conference, behind only Northeastern. Maguire and O’Connor are in the middle of the pack as far as save percentage, both overall and even-strength, but they’re being tested more frequently than any other starters. None of these numbers give a comprehensive picture of these goalies’ value to their teams, but together, they show a few different sides of their performances. The evaluation is also incomplete without an understanding of the quality of shots each player has faced. If I can compile enough shot charts, maybe that’ll be an offseason project. *Vermont’s Brody Hoffman is omitted from the even-strength save percentage chart only because Vermont’s website doesn’t keep track of power-play shots, so I couldn’t calculate it. Matt O’Connor’s rookie season is over. The freshman goaltender for the No. 19 Boston University men’s hockey team underwent surgery for his collapsed lung Thursday afternoon, according to coach Jack Parker, and will not return to action this season. O’Connor has been hospitalized since Saturday, when he was scratched from his start against the University of Vermont, and after the puncture in his lung didn’t patch itself up over the course of the week the way doctors had hoped, they decided to perform surgery. Parker said O’Connor suspected a shot to the ribs Feb. 15 vs. Maine might have been what caused the collapsed lung — formally known as pneumothorax — but symptoms did not present in earnest until Saturday. According to Venis, O’Connor had had some rib pain and a cough earlier in the week, then complained of shortness of breath during Saturday’s pre-game skate. That’s when Parker and team doctors made the decision to not let him play. The goalie dressed for the contest but did not take to the ice for introductions before puck drop, and when he was absent from the bench for much the game he was actually at the hospital getting chest x-rays. The plan had been for O’Connor to get the tests done after the game. Although O’Connor mentioned the blunt force in Maine, Venis said the official diagnosis is “spontaneous pneumothorax,” which O’Connor has many of the risk factors for — he’s tall, thin, athletic, male and between 10 and 30 years old. Parker said operating was not originally the plan, but about 40 percent of those who suffer from pneumothorax experience it again. With surgery, that is not expected to be an issue. The Toronto, Ontario, native’s mother, Lesley Hadrill, is in Boston, and Parker and many teammates have visited him in the hospital, according to the coach. O’Connor will end his season with a .910 save percentage and 2.86 goals-against average. He went 8-8-2 in 19 games, 18 of them starts. Freshman Sean Maguire, who has largely split time with O’Connor all season, is slated to be the full-time goalie, while junior Anthony Moccia, a Medford native who has not seen ice time in his two seasons on the roster, will be the backup. The Boston University men’s hockey team finally has a number-one goaltender, but not by choice. Freshman Matt O’Connor is out indefinitely with spontaneous pneumothorax and is expected to make a full recovery, according to a team source. Spontaneous pneumothorax is a collapsed lung that happens with no apparent cause. O’Connor is in the hospital as of Monday evening. There is no information available on a recovery timeline. “A small area in the lung that is filled with air can break open, sending air into the space around the lung,” according to the U.S. National Library of Medicine. Tall, thin people are more likely to suffer collapsed lungs. The 6-foot-5, 201-pound O’Connor has posted a .910 save percentage and 2.86 goals-against average in 19 games (18 starts) in his rookie campaign. The news comes two days after freshman Sean Maguire started two games in a weekend for the first time this season. After making 49 saves and one goal in a win against the University of Vermont Friday night, Maguire gave up four goals the next night, just hours after finding out he would make the start. BU coach Jack Parker said after Saturday’s game O’Connor had trouble breathing during the pre-game skate Saturday afternoon, and the team made the decision to hold him back shortly thereafter. Maguire, whose .914 save percentage and 2.95 GAA in 15 games are quite comparable to O’Connor’s numbers, is in line to be the team’s regular goalie. Annie Maroon contributed to this report.